Over three years ago, the United States launched two rovers to mars. They were planetary spacecraft designed to wheel their way over the Martian sands for weeks. The rovers were launched with great expectations: to wander around over 600 meters of Mars for 90 days. After that, the designers said their warranty ran out. Anything over 90 days and 600 meters was gravy. The reason the warranty was so short was that the environmental conditions on the red planet are harsh – and that’s being generous. In the daytime the surface temperature may approach two or three degrees C in the bright sunshine. But at night the temperature drops to over minus 100 degrees. The atmosphere is precariously thin by any standards, about 1/100th that of the earth under the best of conditions and many times less than the top of Mount Everest. Yet in this near-vacuum, the Martian winds can kick up dust and rain it down as a constant layering of the thin particulates blown about by the thin Martian desert air. The designers of the rovers felt this dust would ultimately kill the mission in 90 days. It would slowly obscure the solar panels that charged its lithium ion batteries and in so doing, the added effect of the bitterly cold nighttime temperatures would kill any chances of battery recovery. In 90 days or so, they felt certain it would just be all over for the rovers. They were wrong - very wrong. Not only did the dust not settle as they thought, what did settle was blown off by passing dust devils whipped up in the thin but active atmosphere. 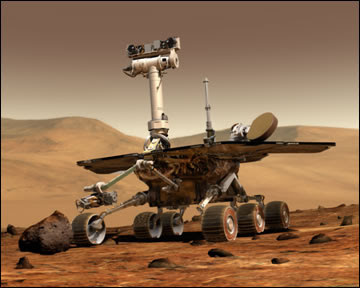 And the combination of a good daily charge and the plutonium heaters inside each battery kept the beasts called Spirit and Opportunity alive on near opposite sides of Mars. However, no one was foolish enough to believe that they could withstand a Martian winter when the sun would dip lower and lower and the temperatures would follow suit. At night on a Martian winter, the temperature drops lower than the temperature of dry ice and the carbon dioxide literally precipitates out of the atmosphere and settles as a fine frost on everything – including alien robots from another planet. Nothing on earth – not even in Antarctica does this planet experience such extremes. But they did survive the Martian winter – twice - and phoned home faithfully each day. The plucky little interplanetary robots are still alive and well, having exceeded their warranties by some unbelievable margins, as the graph above clearly demonstrates. 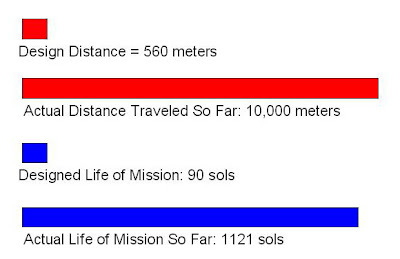 They were designed for a life of 90 sols (a Martian day) - they have passed 1,100. They were designed to travel 600 meters before dying – they have passed 10,000, crossed deserts and low mountain ranges and they are still alive and well. Some vehicles are just made to keep on going. But 17 times the warranty? In my car that would mean that I would clock 1.7 million miles. This is not likely – even in Florida temperatures and paved roads. To follow the rovers day-by-day and download a mass of photos and videos, click here.